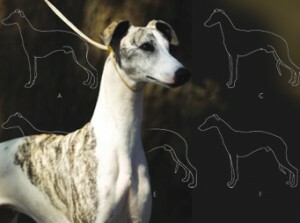 Medium-sized, elegant, athletic, and smooth-coated, the Whippet is one of the smaller of the traditional sighthound breeds. While Greyhounds were owned by the aristocracy in earlier times, the Whippet was known as “the poor man’s greyhound” and used for poaching, hunting, and racing. The breed was 61st among AKC’s registrations in 2017, but is often well and successfully represented in dog shows when compared to several other breeds that rank higher. Sixty Whippet breeder-judges were found, and those with email addresses were invited to take a survey to identify their priorities in their breed. Forty responded and agreed to participate. Twenty-seven returned surveys. The breeder-judges averaged almost thirty years in the breed and nearly fifteen years judging the breed. Most have judged Whippet specialties and many have judged their national. Some judge just Whippets; others judge the hound group and more. The survey included a list of characteristics from the Whippet standard for the breeder-judges to prioritize from the most important to the least important. Below is the list of virtues in sequence by the breeder-judges’ average priorities, with 1 being the most important. Posted by Alex on Jan 2 2019. Filed under Current Articles, Featured. You can follow any responses to this entry through the RSS 2.0. Both comments and pings are currently closed.